Muscle soreness is a very common issues we may have when doing exercise or pushing our body harder to finish some tasks. While most of the time it is not a life threatening problems, it is still preventing us to be more active or even doing our everyday activities. Pain reliever solutions like Icy Hot vs Aspercreme can be a good solution for a muscle soreness but if you wonder which brand provide a more promising result, go check our article below for more information. Anytime is a good time to start living healthier and finally execute that fitness routine you have been put in the drawer for a few years. It is never easy to start a new lifestyle, a better lifestyle for our wellbeing and it is never late to change ourselves. Living a healthier lifestyle is great to make sure we can enjoy our life longer and fitter because nobody wants to get sick since not only we can’t enjoy what we have earned, we will miss many good things that may happen in the future. While starting to be more active is great, it is not always easy and even just to gather the energy to do it is already seems tiring. Another issue when starting workout is muscle soreness or other related pain because our body is not used to the regime yet and this can be very troubling. Muscle soreness itself is not a dangerous or life threatening condition but the pain and uncomfortable feeling will hinder us to do daily activities and continue our fitness regimen. Taken from WebMD, according to Rick Sharp, a professor of exercise physiology at Iowa State University, muscle go through a bit of physical stress when we do some exercise and the mild pain feeling is a natural outcome of any physical activity so it is not uncommon and happens in the beginning stage of program. While this is very common, professional still don’t find any panacea to solve the problem but there are some remedies to ease the effect. If you think the soreness is hindering you to do other activities, we can apply some ice, rest for a while, applying some inflammatory medication, do massage on the sore area, apply heat and don’t forget to stretch. Among those many options, one of the easiest and effective is by applying some heat and this is because when muscle temperature is increased, blood flow also increase and brought fresh oxygen as well as carry healing nutrition to the injured site, quickens the healing process. Heating solution has been used since long time ago to relieve some pain so it is not surprising to see there are so many heating products in the market offering heating patch, cream or gel to help treating your soreness. Most of them are hot while some giving a cold effect as well and the option is all in our hand for we may have different preference that we thought better for our current issue. Topical pain reliever is one of the most popular sore muscle solution and they are very effective for light to mild pain. We can get them easily from nearby pharmacies as over the counter medicine without needing doctor’s prescription. 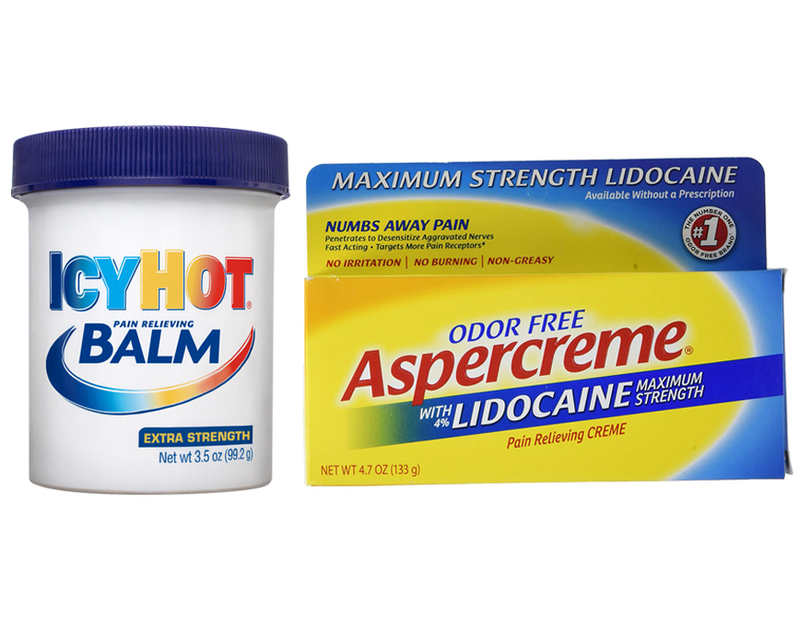 One of the most popular topical pain relieving solution we can choose is Icy Hot. This brand is a product Chattem which is an America company and already producing over the counter medicine since decades ago. Icy Hot itself is a brand so they do have a lot of products to offer. The one we put on our sample picture above is one of the brand’s best-selling solution and it is a balm. Balm is indeed not very easy to apply, such as when working or while doing other activities and need a quick relief from the pain. But, Icy Hot also offer several other type of applications to ease the user from heating patch, spray solution, cream, gel, lotion and even roll on to allow us apply them faster and easier anytime. Read also: Tiger Balm Red vs White here. Before applying any medicine, it is always good to check what they are made from because it can give a glimpse of how the product should work in our favor including when using topical pain reliever. Icy Hot ingredient list is kept simple and traditional but by no mean uneffective because they have what has been long used to treat sore muscle which is Menthol and Methyl Salicylate. These two are actually very similar to each other but also different. As you may already know, Menthol is derived from mint plant and it is known for the cooling sensation when applied on skin as opposite to chili capsaicin which creates a burning sensation on skin. This ingredient actually don’t do anything to the source of pain but it does feels like relieving pain because the cooling sensation is acting as counterirritant. This mean, it is introducing new sensation to skin and distract our brain from the actual pain similar like capsaicin. It does feels cool but by no mean reducing the skin temperature like when putting ice on them. Menthol creates cooling sensation by attaching to a certain neuronal receptor and making it like the pain change into a more pleasant cool feeling. As for Methyl Salicylate, this ingredient is also called as oil of wintergreen because it is derived from the plant leaves since it contains almost 99% of the substance which is very pungent. What’s interesting is this oil has the same scent like mint and has the same cooling effect so we often see them together in pain reliever solution. The difference between both only comes down to the chemistry ion channels and unlike menthol that cause only cooling effect, this one also introduce burning along the cold since it also trips heat channel on our skin, similar like the same what affected by capsaicin. 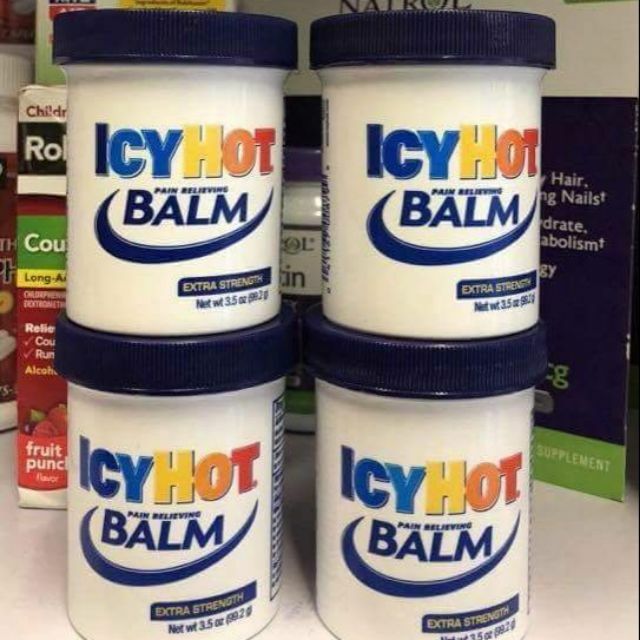 This is probably why the product is called Icy Hot. Moving further, there are so many options when it comes to topical medication for mild pain and still from the same manufacturer, Chattem, we have another pain reliever to pick called Aspercreme. This brand is used to market a line of product which the same goal is to help people staying active even when they experience pain in some part of their body. What set this brand apart from Icy Hot is it seems this one introduce a more potent numbing agent and focus more to joint pain. Aspercreme itself is not only available in cream form like the one in our article below but also in several other solution such a patches and roll on. All of them are giving the same benefit and mostly made with the same ingredients. As you can see from Aspercreme, it is putting the main ingredient clearly on the package so we can guess what the cream will do to our joint pain. Lidocaine is very popular used as a numbing agent in a pain reliever and it is actually a synthetic substance. As a local anesthetic, it is used to numb tissue in a specific area, first synthesized under the name of xylocaine by Swedish chemist called Nils Lofgren back then in 1943. It blocks the conduction of impulses and stabilizes neuronal membranes which is why we can get pain relieving effect from the ingredient. When applied on skin, whether it is through a cream or with a patches and other solution, the drug began to penetrate the skin and act locally on the damaged or dysfunctional nerves as well as the soft tissue underlying the site. For solution with 5% of Lidocaine, it is estimated around 3% will be absorbed and produce analgesia without anesthesia. 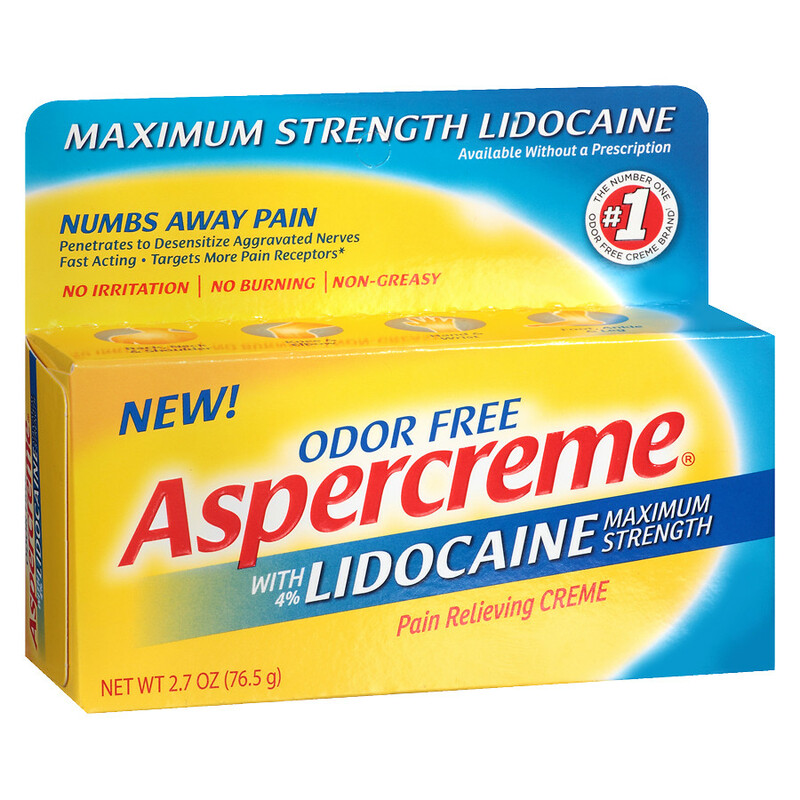 Aspercreme itself has 4% of Lidocaine but since it is cream, the absorbance level may be better than when using a patch. There is a study about this local anesthetic in which patient experience pain reduction within 30 minutes with some of them can even feel the pain relief effect ranging from 2 to 4 hours after the initial application. The reason why this solution has lesser Lidocaine than patches is because we are not supposed to absorb much of the drug as well as the highest approved by FDA. This can benefit us as to adverse the effects of absorbing the drug such as central nervous system depression and averting excitation. Local absorption is also preferred because we have to consider some people who are experiencing chronic pain may also require other solution as well like opioids, nonopioids or adjuvant analgesics. Now, let’s compare Icy Hot with Aspercreme. As you may already know, Icy Hot is used mainly for muscle pain or soreness while Aspercreme is more into those who experience joint pain or arthritis. Their main ingredients are also different and Icy Hot only act as counterirritant to distract our brain from the real pain while Aspercreme is using Lidocaine that act as a local anesthetic to numb the problematic area. All in all, the decision is all yours to make because we may have different issue but it is always best to match your problem with the solution so we can get the best result. If you are experiencing sore muscle or muscle pain, Icy Hot is probably enough to relieve the pain but if you are suffering from joint pain or arthritis, Aspercreme is the ideal solution.